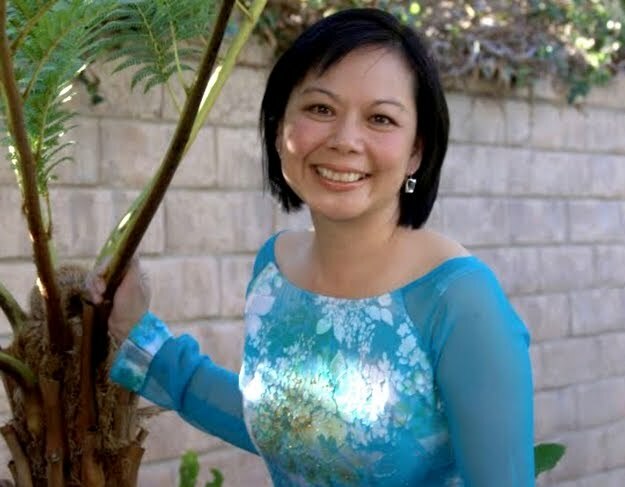 Our series of reflections on Amelia from Seattle Opera audience members continues, with thoughts from Marie Tran, who teaches Business Management at Edmonds Community College. The Vietnam War created a massive exodus of Vietnamese refugees to the U.S. and surrounding countries. During and for many years after 1975, many Vietnamese risked their lives to seek freedom rather than live under the Communist regime. When I left Vietnam at the age of 9, I was perhaps too young to put much thought into the lives of American veterans who fought in Vietnam. I was not aware of the impact it had on their lives and families in the U.S. In Amelia, Dodge’s passion for flying and his duties to his squadron and country conflicted with his love and obligation to his family. Dodge had to make a very tough decision to “go or to stay” as did many Vietnamese refugees who decided to flee during and after the war. For many Vietnamese refugees, the decision was just as difficult, for it always involved risking death in the escape as well as the decision to leave many loved ones behind. As in any war, how can we ever account for the loss of those who fought in the war and those who were left behind?" 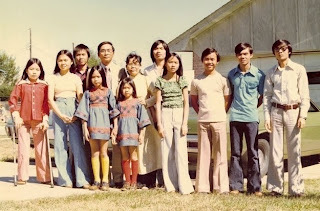 Marie Tran (third girl from left) with her parents and nine siblings at their home in Tulsa, Okla., where the family was sponsored by the Catholic Diocese of Tulsa after fleeing Vietnam in 1975. "Act 1 Scene 3 of Amelia was moving, intense, and most powerful. 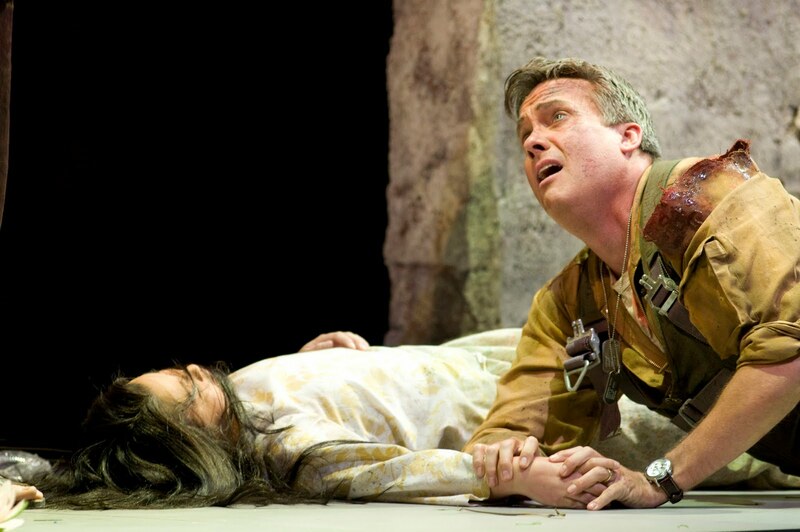 To me, this was the best scene in the opera, as Amelia and her mother come to grip with the truth of the death of a husband and a father. The scene of Amelia and her mother Amanda returning to the village where Dodge was shot made me extremely sad. I again reflected on the deep loss from both sides of the war (the Vietnamese people and the American allies). The scene portrays the cruelty that humans are capable of inflicting on each other, cruelty too often still evident today throughout the world. The killing of the local family’s daughter and Dodge left me to further reflect on the parallel of their pain and losses. Huy and Trang lost their daughter, and Dodge also lost the opportunity to share his life with his daughter in the U.S. I was especially touched when Dodge with his gunshot wound slowly managed to crawl over to touch the hand of the farmer’s daughter and handed the photo of Amelia to the Vietnamese couple before he was dragged away." Lisel Perrine as Huy and Trang's daughter and William Burden as Dodge at the end of Act One, Scene Three of Amelia (photo by Rozarii Lynch). "Facing the truth and searching for healing is well portrayed in Amelia. Searching and delving into our past can often be a painful process but a critical and necessary one in order to heal. The journey of self discovery we witness in Amelia takes time and often requires us to confront hidden memories which can often be extremely painful. However, when we are in touch with our past and are able to make peace, it can heal us and move us forward. I can relate to Amelia’s struggle to search for the truth so that she can move forward with her life as she prepares to bring a new life into the world. As with Amelia, I too often question why one may want to bring a child into this world when there is so much pain. After seeing Amelia, I am left to reflect on my own personal losses from the Vietnam War, my family’s escape and my personal return to Vietnam after 33 years. Like Amelia, I was fueled by the need to understand my past, the desire to bridge the lives of the two cultures which are a part of me...my return to Vietnam, like Amelia’s, was a search for my identity." CLICK HERE to read a recent Everett Herald article about Marie Tran's experiences, including her work with Peacetrees Vietnam.